North Crawley’s unbeaten start to the season continued on Saturday with a seven wicket drubbing of Thurleigh. Three wickets apiece for Steve Sharpe (3-17) and skipper Richard Bryce (3-21) reduced the home side for just 82. And with opener Alex Walker in searing form, he quickly led the charge from the front. Walker added an unbeaten 60 to his season tally - raising it to 332 in three games - as Crawley (85-3)cruised to victory. Milton Keynes closed the gap to Thurleigh in second with a five wicket win over Buckland & Aston Clinton thanks to a huge part played by Daniel Brady. The bowler took an incredible 8-22 as Buckland were all out for just 64. But a top order collapse threatened to derail MK’s chase, but 41 not out from number five Jalil Sear helped them over the line (65-5). New Bradwell picked up their first win of the season with a six wicket win over Biddenham. James McMillan took 5-35 to restrict Biddenham to 168 all out. In reply, Chris Timms hit 73 not out to help New Bradwell (169-4) to win. 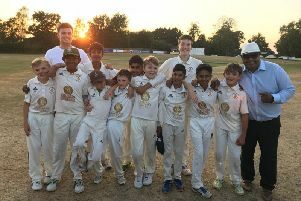 Amit Mulay’s fifer for New City helped them to a four wicket win over Eaton Bray. Mulay took 5-24 to limit Bray to 132, a total New City knocked off in 38.4 overs. MK City (102) lost by 61 runs to Elstow as they chanced down 163-8. In Division 2, Aspley Guise (93-4) made light work of Cranfield University (89), Newport Pagnell (64) were thrashed Eggington (65-4), and North Crawley 2nds (166) came up short against Bromham (199-9). In Division 3, Basil Lall hit 111 in Open University ‘s (192-8) against Luton Caribbean(191-5). Printers’ (226-5) Razzan Mohamed scored 106 to help his side to beat Caddington (129), Harlington (195-5) beat Shenley Church End (159) and centuries from Asad Shah (101 not out) and Harry Singh (113) helped Westcroft (262-4) thrash Tring 4ths (73). New City 2nds (215-5) beat Milton Bryan 2nds (213-8) in Division 4, Olney (148) lost to Whitchurch (152-2) and Westcroft 2nds (255-5) drew with MK 2nds (184-5). In Division 5, North Crawley 3rds (205-8) drew with Edlesborough (128-9), Great Brickhill 3rds (170-7) beat New Bradwell 2nds (106) but MK City 2nds (97-8) lost to Elstow (98-3). In Division 6, Old Bradwell 2nds (145) lost to Caddington (176-8), but Newport Pagnell 2nds didn’t play as Cublington 3rds conceded. New City 3rds (149-9) didn’t score big enough against Wing with Wingrave 2nds (152-6) to lose by four wickets. Printers 2nds (217-2) couldn’t bowl out Wolverton 3rds (171-9) and Bletchley 3rds conceded to Aspley Guise 2nds.